OIL WARS – The Coming New Disaster? If protecting market share is OPEC’s primary objective in not reducing oil production, and if oil prices remain depressed or continue their downward journey over the next few months, then it becomes only a matter of time before OPEC members begin to pounce on each other’s market shares and on non-OPEC shares. In such a scenario, the outcome is likely to be in favor of whoever has the lowest cash production costs and the highest surplus funds to weather the oil revenues squeeze. Of the big producers, Saudi Arabia and Kuwait are the best positioned to win such a price war and Venezuela and Nigeria are likely to be the biggest losers followed at some distance by Iran, Iraq and then Russia. Author MarsalPosted on December 25, 2014 August 9, 2016 Categories Economics & Business, OtherTags Economic Impact, Oil Crash, Oil Prices, Opec, Political Impact, أوبك, اسعار النفط, التبعات الاقتصادية, التبعات السياسية, هبوط النفطLeave a comment on OIL WARS – The Coming New Disaster? Four years ago, we published in www.asmainfo.com, the Arab Stock Market Analysis website, a technical analysis forecast of crude oil prices which indicated the likelihood of oil prices dropping in 2014 towards US$ 33 per barrel ! Technical Analysis is a mathematical statistical tool to identify trends and possible future prices and as such sees what the naked eye, used to empirical evidence, does not see. 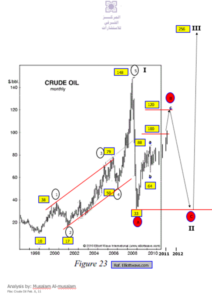 Even a non-expert in technical analysis can see from the attached graph that the oil price rise between 2003 and 2008 was very high and steep thus inviting a steep downward correction. Another steep rise occurred in the period between 2008 and 2014. However, there is a sunny side to this storm. The same analysis indicated the possibility of oil prices rebounding up towards the US$ 200 – 250 range in a few years. But, such a rebound would be conditional on the World’s presently weak economies regaining their vitality, no alternative to oil is discovered and no devastating regional or world wars occur.